I have just uploaded a small demo of how to adjust brightness, contrast and saturation of an image. 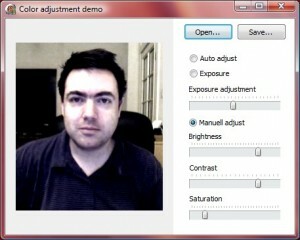 There are also two other usefull samples included in the demo. One is the auto adjustment setting (using histogram stretching) the other one is an exposure control, perfect for adjusting (lighten) dark pictures. Hope you find it usefull and if you have some better ideas why not share em. These routines are based on a combination of my own and others ideas and source code.